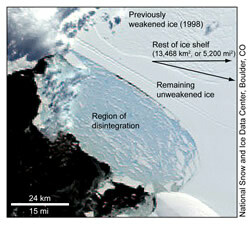 Antarctica: Wilkins Ice Shelf "Hanging by a Thread"
Even though it is the dead of winter in Antarctica, the 6000–square-mile Wilkins ice shelf appears to be hanging “by a thread” according to scientists and is in imminent threat of breaking up off the Antarctic Peninsula. …the most recent in a long, and growing, list of ice shelves on the Antarctic Peninsula that are responding to the rapid warming that has occurred in this area over the last 50 years”, according to David Vaughan of the British Antarctic Survey. …the truth is it is going more quickly than we guessed”. Scientists first warned last March that the pace of Wilkins’ breakup was accelerating, but had also expected the freeze of winter to put a temporary halt to its progression. That didn’t happen as expected either. It is now suspected that warm water is welling up from underneath the ice shelf, continuing its hastened decline, even in the middle of winter. Since the ice shelf is already floating in the water, it’s breakup will not cause sea levels to rise. It was also reported last week that Argentina’s famed Perito Moreno glacier has been calving ice leading to a spectacular collapse of a massive ice tunnel. The tunnel forms every four to five years its eventual collapse is always expected, though during Argentina’s summer, September through May, and not in the middle of winter.